What’s a Mercury? For the past 30 years or so, the Mercury badge has generally meant a re-trimmed Ford product with slightly different styling and features, offered mostly to give Lincoln-Mercury dealers something to keep them alive between Navigator and Town Car sales. Other than the “electric shaver” grille treatment of recent cars (reminiscent of the 1967 Mercury Cougar), there’s little of substance to differentiate a Mercury from its Ford sibling. Throughout Mercury’s roller-coaster 68-year history, however, FoMoCo has made periodic stabs at giving its ill-starred middle-class division a unique product to sell — like the 1963-1968 Mercury Breezeway sedans. For all former chairman Alfred P. Sloan’s rhetoric about offering cars for every conceivable market niche, the main reason General Motors long had a surplus of middle-class brands is that it started out that way. General Motors was originally formed as a conglomerate of other existing automakers: Buick, Oldsmobile, Oakland (the predecessor of Pontiac), Chevrolet, and Cadillac were all independent automakers before becoming part of GM. The same was true of Chrysler’s Dodge Division; the Dodge Brothers were selling cars long before the formation of the Chrysler Corporation. While Ford’s Lincoln division was originally a separate company that Henry Ford had acquired in the early twenties, Mercury was created out of whole cloth in the late thirties. It was founded at the urging of Ford Motor Company president Edsel Ford, Henry Ford’s only son, who had been concerned for several years about the vast price gap between the most expensive Ford and the cheapest Lincoln. Henry Ford, whose interests lay almost entirely in the low-price field, wasn’t particularly concerned, but Edsel recognized that the company was losing a lot of middle-class buyers. Customers who wanted something bigger or fancier than a Ford, but who couldn’t afford a Lincoln, were simply leaving for Pontiac, DeSoto, or other middle-priced rivals. Development of the first middle-class Ford began in July 1937, led by engineer Larry Sheldrick and Ford design director Bob Gregorie. It was in almost every respect a bigger version of the standard Ford; its chassis, suspension, and running gear were nearly identical and it used a bored-out version of Ford’s familiar flathead V8. Edsel even wanted to call the new model the Ford-Mercury, but Gregorie and the Ford sales organization eventually convinced him that it was better to brand the new model as a separate entity. The first Mercury bowed in October 1938 as a 1939 model. Although its obvious Ford origins earned it some derision, it was reasonably popular, selling about 69,000 its first year, more than 81,000 in 1940. Its bigger engine, with about 10 more horsepower (7.5 kW) more than the regular Ford V8, made it particularly popular with hot-rodders, and postwar Mercurys became a favorite of customizers. By 1949, Mercury sales topped 300,000 units a year. The 1948-1950 Mercury coupe was a popular basis for “lead sleds” and other customs, particularly in 1949, when its flathead V8 was stroked from 239 cu. in. (3,910 cc) to 255 cu. in. (4,194 cc), raising rated horsepower to 110 (82 kW). Mercury sold well through the mid-fifties, but Ford still wanted a bigger slice of the mid-priced market. After a lot of debate, the company decided to separate Mercury from Lincoln add a new mid-price division, Edsel, positioned more or less between Ford and Mercury. Mercury, meanwhile, was supposed to move upscale, filling the gap betwen Ford’s existing mid-price cars and Lincoln. Mercury sold very well in 1955 and 1956 and then lost steam in 1957. This is a 1956 Mercury Montclair hardtop with the 312 cu. in. (5,111 cc) Y-block V8 with up to 225 gross horsepower (168 kW). In 1957, Mercury received a new image-leader model, the Mercury Turnpike Cruiser. The Turnpike Cruiser had originated as a 1956 show car called the XM-Cruiser, styled by Don DeLaRossa under Mercury studio chief Elwood P. Engel. Its most novel feature was an unusual roof treatment Mercury dubbed “Breezeway.” Possibly inspired by the contemporary Packard Predictor show car, it had reverse-slant C-pillars with a rear window that could be opened for ventilation, the latter a throwback to prewar days. The Breezeway roof was subsequently adopted for the production Turnpike Cruiser, giving it a unique silhouette and allowed both excellent ventilation and fine headroom for rear-seat passengers. 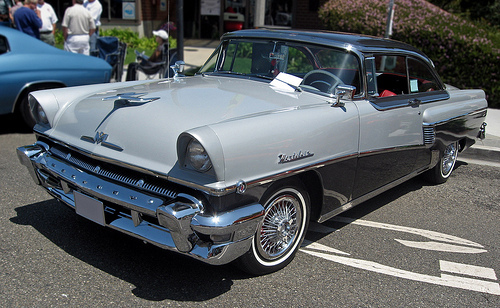 The Turnpike Cruiser was not a sales success, but a similar roofline was applied to the 1958 Lincoln Continental line. Unfortunately, both the Edsel and Mercury’s move upscale proved to be ill-timed, arriving at the same time as the 1957-1958 Eisenhower Recession. Even if the public had loved their styling and features, which they evidently did not, all mid-price brands were hit hard by the economic downturn. Mercury’s sales fell from almost 328,000 in 1956 to 153,271 in 1958 and fewer than 150,000 for 1959. By 1961, Edsel was dead, Mercury and Lincoln had been reunited, and Mercury was back in its traditional role of selling redecorated, slightly plusher Fords. 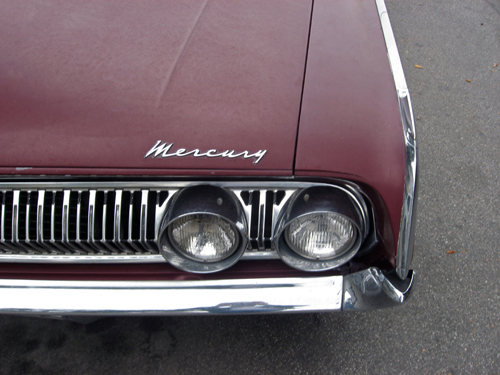 The Mercury line was all-new in 1963, although it still shared the body shell of the big Ford. For reasons now obscure, Mercury stylists decided to revive the Breezeway roof, although neither the Turnpike Cruiser nor the 1958-1960 Continentals had been particularly successful. It appears that the styling of the 1963 Mercurys was originally intended for the 1964 Fords, so it’s possible that the designers intended to use the Breezeway roof on the full-size Ford line, creating a styling ‘trickle-down’ effect. For whatever reason, the Breezeway ended up a Mercury exclusive. It was offered in four variations: two- and four-door pillared sedans and two- and four-door pillared hardtops. Like all 1963-1965 Mercurys, the Mercury Breezeway had a standard 390 cu. in. (6,391 cc) V8 with 250 gross horsepower (186 kW) from a single two-throat carburetor. With well over two tons (1,900 kg) of curb weight, progress was best described as ‘stately.’ With the base engine, 0-60 mph (0-97 km/h) took between 11 and 12 seconds and top speed was around 105 mph (169 km/h). The optional four-barrel version of the same engine would get you to 60 mph (97 km/h) about a second quicker and give you a top speed in the 110 to 115 mph (177 to 185 km/h) range. A three-speed manual transmission was theoretically standard, but the vast majority of these cars had three-speed Cruise-O-Matic. The Breezeway was a pleasant car for passengers, offering both shade and excellent ventilation with minimal buffeting, although it was odd-looking and none too aerodynamic. If nothing else, the Breezeway roof did serve to differentiate the Mercury line from the big Fords, although that distinction was muddied midway through the 1963 model year when Mercury added a more conventional-looking Marauder hardtop to the line, sharing the sleek “slantback” roof of the 1963-1/2 big Fords. 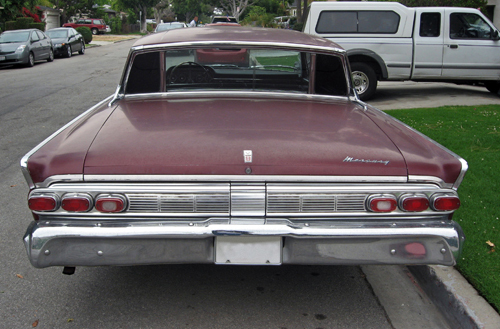 The slantback roof had been introduced for the benefit of Ford’s NASCAR racers and its appearance on the Marauder was intended to support Mercury’s own return to racing in 1963. As a result, the slantback Marauder was far more heavily featured in advertising than the Mercury Breezeway, even though the latter accounted for the bulk of Mercury’s full-size sales. The center section of the Mercury Breezeway’s rear window can be lowered electrically, allowing good ventilation with less wind noise than driving with the windows opened. Thanks to the roof overhang, it can be opened even in light rain with little fear of rear passengers getting wet. Those sales weren’t terribly impressive in any case. Mercury buyers weren’t blown away by the looks of the Breezeway and Mercury’s total 1963 volume was down almost 40,000 units from 1962; the compact and midsize lines outsold the big Mercury Breezeway cars by a significant margin. 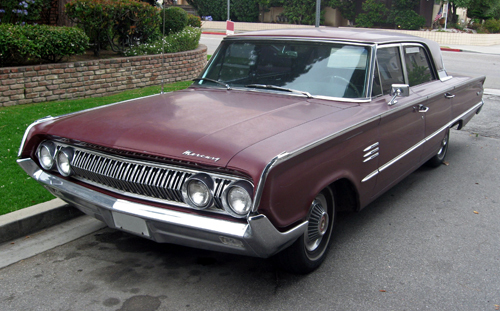 Sales were little better the face-lifted 1964s, which deleted the four-door hardtop Breezeway in favor of a four-door version of the sportier Marauder hardtop. Business rallied a bit for 1965 and 1966, but model-for-model sales of the full-size cars were depressing; only the four-door sedans broke into the five-figure range. This Mercury Breezeway is a 1964 Mercury Montclair four-door sedan, the most popular body style, although that meant only 15,520 sales. Base price was $3,116. The Breezeway is an enormous car: 215.5 inches (5,474 mm) long on a 120-inch (3,048mm) wheelbase, tipping the scales at around 4,500 pounds (2,040 kg). With the standard suspension, the Mercury Breezeway had nautical handling even by the standards of its time; heavy-duty suspension was theoretically available, but rarely ordered. Brakes, 11-inch (279mm) drums all round, were also barely adequate for its ponderous weight. In consolation, build quality for Fords and Mercurys of this vintage was excellent and survivors are surprisingly solid, particularly given their age. At various times, Mercury had had a reputation as a fairly hot car, but the Breezeway cars were not particularly fast. You had adequate but unexceptional performance from your a choice of 390 cu. in. (6,391 cc) V8s offering 250 to 300 gross horsepower (186 to 221 kW) or, if you were especially well-connected or persuasive, a 330 hp (246 kW) police version of same, seldom seen on civilian cars. A handful of 1963-1964 Mercurys were ordered with Ford’s 427 cu. in. (6,986 cc) V8 in either single-quad (410 hp/306 kW) or dual-quad (425 hp/317 kW) form, which trimmed the big Merc’s 0-60 mph (0-97 km/h) times to less than 8 seconds and provided a top speed of over 130 mph (210 km/h), but the 427 was rare, expensive, and finicky. It was definitely a specialist engine: It could only be ordered with the optional four-speed manual and couldn’t be had with power steering, power brakes, or air conditioning — the belts wouldn’t stay on at the 6,000+ rpm engine speeds of which the 427 was capable. Big Fords and Mercurys in 1964 still used Hotchkiss drive in the rear, a live axle on multi-leaf springs. The springs were softened for a smoother ride, which led to poor axle control and a sea-sick quality on rough pavement. The 1965 models adopted a three-link, coil spring suspension instead. The Mercury Breezeway body style was discontinued after 1966, although Lincoln-Mercury continued to offer a less dramatic version of the retractable rear window on big Mercurys for a few more years. It was obsolete by the late sixties, since the same effect could be achieved with a good flow-through ventilation system — something Ford pioneered in the U.S. on the 1964-1966 Thunderbird. By 1970, Mercury had once again relinquished any distinctive body styles for its mainstream cars. 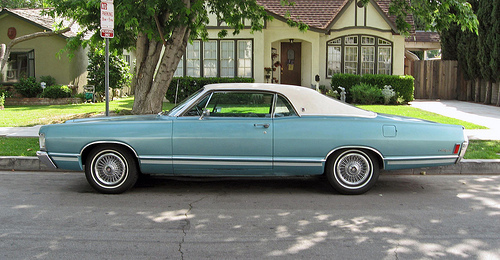 By 1968, Mercury had reverted to more conventional roof lines; this is a 1968 Mercury Marquis hardtop. Since then, Mercury has made occasional stabs at offering unique products, usually “captive imports” like the European Ford Capri, the Nissan-based Villager, and the Australian Capri roadster, seldom with much enthusiasm. Ford seems to lack either the will or the resources to seriously distinguish the division from its Ford mate. Why Ford keeps Mercury alive is an interesting question. It does not appear that re-badging Fords lets them sell more cars — at this point, any additional prestige the Mercury name might have carried is long gone and it’s unlikely that anyone is buying a Mercury who wouldn’t buy the same thing with a Ford badge. A more significant reason is that Mercury is paired with Lincoln. Having products to sell other than Lincolns helps to keep those dealerships afloat, particularly given the ongoing “die-off” of Lincoln’s traditional buyers. Still, one may question the logic of offering multiple, badge-engineered variations of cars for which buyers seem to have only mild enthusiasm to begin with. Rumors have been flying for the past few years that Ford CEO Alan Mulally will finally pull the plug on Mercury, but Ford has yet to issue a definitive statement one way or the other. 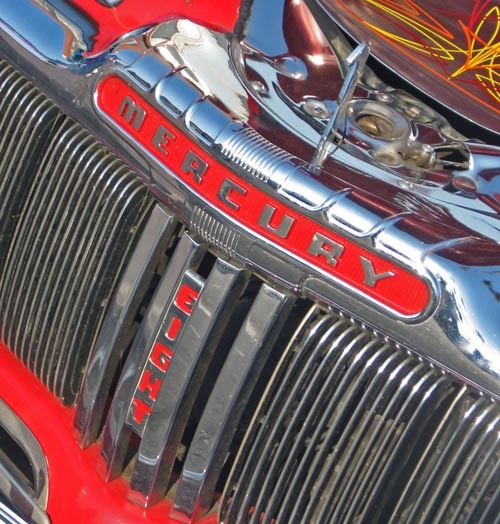 It appears that in the corporate mindset Edsel Ford’s original logic holds true: Mercury may not be a great brand, but it fills a gap they think needs to be filled. If we must have Mercury, though, maybe a little genuine wackiness wouldn’t hurt. Our sources for this article included the Auto Editors of Consumer Guide, “1963-1968 Mercury Breezeway,” HowStuffWorks.com, 20 August 2007, auto.howstuffworks. com/ 1963-1968-mercury-breezeway.htm, accessed 23 August 2007, and Encyclopedia of American Cars: Over 65 Years of Automotive History, (Lincolnwood, IL: Publications, International, 1996); David Crippen, “Reminiscences of Eugene T. Gregorie,” 4 February 1985, Automotive Design Oral History Project, Accession 1673, Benson Ford Research Center, www.autolife.umd. umich.edu/ Design/Gregorie_interview.htm [transcript], accessed 20 August 2007; John Gunnell, ed., Standard Catalog of American Cars 1946-1975, rev. 4th ed. (Iola, WI: Krause Publications, 2002); Michael Lamm and David L. Lewis, “The First Mercury & How It Came to Be,” Special Interest Autos #23 (July-August 1974), Michael Lamm, “Gizmobile,” Special Interest Autos #15 (February-March 1973); and Tim Howley, “1964 Mercury Marauder: Twenty-Fifth Anniversary Car,” Special Interest Autos #162 (November-December 1997), all of which are reprinted in The Hemmings Book of Mercurys: driveReports from Special Interest Autos magazine (Bennington, VT: Hemmings Motor News, 2002); “1963 Mercury Monterey,” Automobile Topics October 1962; Wayne Thoms, “Mercury Road Test,” Motor Trend March 1963; “Mercury 427 Super Marauder S-55,” Car Life April 1963; Jim Wright, “1964 Mercury Road Test,” Motor Trend October 1963; and “Mercury Park Lane and Monterey: A Career Girl Emerges with Manners and Taste,” Car Life January 1965, all of which are reprinted in Mercury Gold Portfolio 1947-1966, ed. R.M. Clarke (Cobham, England: Brooklands Books Ltd., ca. 2006). i have a canadian only 1964 mercury meteor it came with a stock 352 and is very similar to the montclair i love it ! people love the power window! My father owned a 63 Monterey Breezeway. He was always a “big Ford” man, and so am I. My parents were impressed by the long line of black Mercs in JFK’s funeral in November 1963 and so they bought theirs in Presidential Black. The Monterey was a very solid car, and very comfortable. My parents were heavy smokers and the Breezeway, alas, channeled all that second hand smoke to me in the back seat. Just opening the wing vents made air quality better all around. About 1967 my father bought a Sears hang-on AC for the car. It was one of those ice-cold R12 jobs whose compressor ran all the time and my mother had to put an old-fashioned lap robe over her knees in the front seat. I never drove that Merc. My parents traded it in 1969 for a Buick Skylark which had awful build quality. The Skylark became my car when I started driving in 1972, and so, awful quality or not, it retains a fond place in my memory. 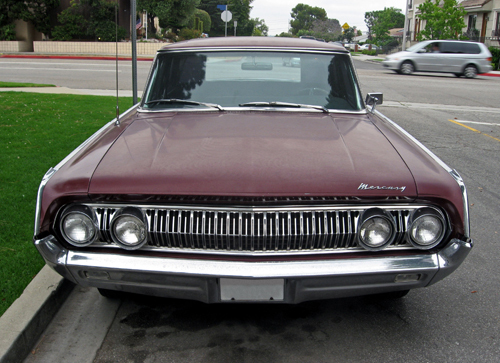 I too have a ’63 Mercury Monterey Custom Breezeway and I am having a ball restoring it! It has factory installed a/c. It has only 43K original miles. I am the 3rd owner and it has been in Tucson AZ the whole time. It is fun to drive and the room in it is to kill for! The new cars just don’t match up to the oldies. My dad restored three cars when I was a kid: a 55 Monterey he kept for nearly 20 years, selling it only recently, a 59 Monterey and a 61 Galaxie. He, my mom and I drove the two Merc’s to Northern New York from Oklahoma the first week of my junior year of high school in 1987. It was the best excuse to get out of school ever. We drove the interstates all the way, the way those cars were intended to be driven. Great article. Love your site. I’m so sad to see Mercury go..although I’m seems like Mercury had been dying for a while. Wow…what a blast from the past. My Dad was a mechanic and LOVED his Fords and Mercs. Galaxy 500’s, Park Lanes, Monterey’s-the list is endless as well as the memories. Hello, I have a 1965 Mercury Monterey that has sentimental value to me. Unfortunately it had some damage done years ago when a tree fell on parts of it and damaged the body. It has now fallen on hard times as the motor is stuck and it is just sitting in my yard. I want to know if there is anywhere I can get parts for this car, especially body parts. I have searched the internet, but can’t find ANYTHING. Please help, I really don’t want to send it to the scrap heap, but am running out of options. any of you folks out there have tail lights? I too have a 1964 Meteor with a 352 V8 Merc-o-matic trans in skyline blue. Made in Canada. this car was built with the slanted bonnet top as I call it however the first owner didn’t order it with the breeseway window. I can always tell when someone remembers this type of car because of the hand signal they use to tell someone the window goes up and down. This is a great car to drive and own, and the trunk is large. They don’t do well at car show, most people want to see hot rods and fast cars. Mine is a classic family car made for vacations with the family to the lake house,beach and cross country driving. stop by the greenfield village motor muster and you’ll see me there with my baby. The British Ford Anglia (1959-1967) and Ford Classic (1962-1964) also had reverse sloped rear windows, with no provision for lowering the glass however. The mark 1 Cortina (1963-1966) rear lights had a close resemblance to Mercury items as well. It didn’t occur to me when this was originally written, but you’re quite right. As we’ll see in an upcoming article, what became the Triumph 2000 nearly did as well, but Ford beat them to the punch with the Anglia 105E. The Citroen Ami 6 also had that reverse rear screen. Flaminio Bertoni’s final design (and not his finest), it was sold from 1961 to 1969. When Citroen brought out the “break” (station wagon) version in 1965, they quickly outsold the original version 3 to 1. Say hi to HANS LEDWINKA!! Is there any way I could contact the owner of the black 64 mercury montclair Breasway,I had a friend years ago that had the exact same car,I have been looking for one ever since.I have found black mercurys,but none with a red interior. We had a white ’64 Montclair when I was a teenager. Very nice comfortable family car. We didn’t roll down that back window very often, because it made the car drafty. I do remember a couple of times while going down the road, laying out on the trunk with our legs hanging down over the back seat. Not very safe. 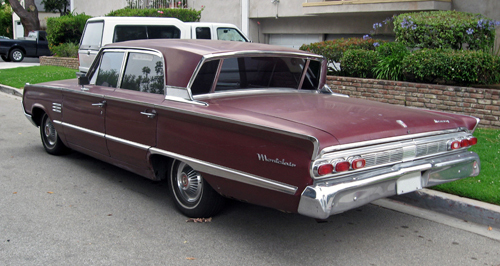 You refer to the “slantback” roof introduced in mid-’63 that was shared with the Galaxie. That roofline, for the’63 and ’64 Ford and Mercury are the only cars ever actually called a fastback in company literature. That fastback roofline has always been a favorite of mine, but I’m biased. I have owned a ’64 Monterey two-door fastback since 1984. Even though everyone, then and now, use the term “fastback” when talking about the Mustang, it was actually called a Sportroof by FoMoCo. A good point. I’m aware that the “slantback” name was unofficial, but it’s much more commonly applied to those cars than “fastback,” which tends to make people think of other, more, well, fastback-y Fords of the era. I have a 1967 Mercury Parklane, 410 V8, 4 door sedan, my first car bought in 1974. The rear window retracts partially and I love having that extra air flow. Unfortunately, the motor just went on it and I don’t know where to find another. Any suggestions? Sorry, I don’t have any insights on parts or repairs. Good luck with it, though — it’s a rare car these days! Hi Laurie the 410 in your Mercury is one of the Ford FE series engines produced from 1958 to 1976. The 390 is the most plentiful of these engines since it was also used in pickups through 1976. They are still fairly common and are a direct swap for the 410. I can’t help with parts, repairs, or restoration, sorry! There were a lot of Breezeway Mercs (and Canadian Meteors) in Winnipeg. Even though these were 1960s, they were a common site well into the late 1980s, which speaks volumes of the good build quality of these cars. FoMoCo really made a mistake in not putting money in the Mercury marque. Jacques Nassers ill fated move to dump development money into Jaguar and Land/Range Rover was fatal to Mercury, and has crippled Lincoln to this day. When I win the LOTTO, I will definitely acquire and restore to showroom condition Breezeways from 1963 to 1966 ! !